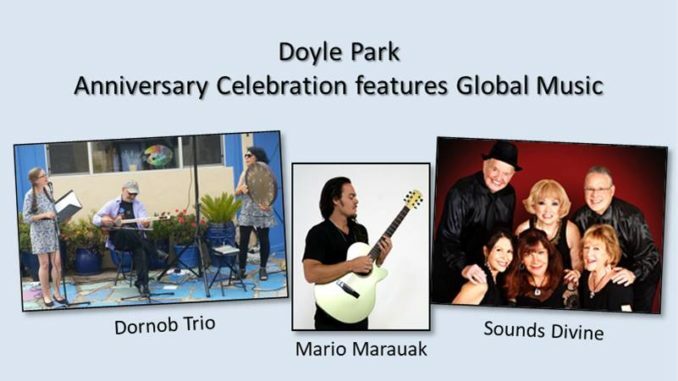 The Doyle Recreation Advisory Group is excited to announce the 25-year anniversary celebration of Doyle Park will be held Sunday, September 16, 5:00-7:00pm. Join friends and neighbors in the park (8175 Regents Road) for an evening of music from around the world. With its proximity to the University of California, San Diego, which attracts students and talent from across the globe, the community surrounding Doyle Park is extremely diverse. In addition to celebrating the 25-year anniversary of the park, the recreation advisory group aims to celebrate the diversity of our community as it is a unifying thread for many of our residents. The timing of the event near the beginning of the school year was intentional, and the recreation advisory group hopes this event can serve as a nice welcome to the new students and families of North University City. Mario Marauak, a singer, songwriter and guitar player from Brazil, will be one of the featured performers. Listening to his music you feel the influences of classic Brazilian Bossa Nova, Samba and Contemporary along with a combination of Reggae, Dancehall and Hip Hop. His greatest strength is a rare musical fusion of Brazilian Classics with America’s African- Influenced beats. Marauak’s repertoire is made of originals, in English and Portuguese, and reinterpretations of other artists. The event will also feature the Dornob Trio, a collective of musicians – now spanning two generations – who’ve been playing Persian music in San Diego since 1985. Their goals, in addition to friendship and fun, include learning the musical traditions, fostering creativity and crossing cultural bridges. And the Sounds Divine Vocal Jazz Ensemble is also scheduled to perform; several of the performers live in University City. San Diego’s premiere vocal jazz ensemble showcases a repertoire of diverse and notable standards with a fresh, cool point of view. Sounds Divine has been wowing audiences with their tight, close harmonies and hip-swinging rhythms which distinctively sets them apart. The Anniversary Celebration is free and open to the public. Bring your own picnic; the recreation advisory group will provide water and cake. Information courtesy of Deanna Ratnikova, Doyle Recreation Advisory Group.